Ryan Spencer, from the University of Canberra is Clinical Teaching Specialist and Lecturer in Literacy Education. Here, he explains why reading your child’s favourite book aloud is so important for learning and development. As parents know all too well, children love to re-read their favourite books over and over again. While this may feel painfully repetitive to adults, there is something in the text that is bringing children back time after time. Children benefit greatly from re-reading as they learn the rhyming or predictable pattern of the text – rather than spending that time trying to understand what the book’s about. Research shows that repeated reading of favourite books can boost vocabulary by up to 40%. But this is only truly beneficial when the text is read aloud. Research shows that when preschool children are frequently read to, their brain areas supporting comprehension and mental imagery are highly engaged. Studies show that this helps with the development of reading skills, such as word recognition, when they start to learn to read. By assisting our children to develop these skills, we’re ensuring that they know that text conveys a message, and to read on for more information when they get stuck on a word. And it’s never too early to start reading aloud to your children. Australian author and literacy studies professor Mem Fox says reading to children from birth can help develop a love for and understanding of books. Fluency when reading is essential in order to build strong and confident readers. But it can frequently be misinterpreted as relating only to reading speed alone. Researcher Timothy Rasinski highlights the “bridge” that fluency plays in between word recognition and understanding what the book is about. He highlights the way that reading fluently at a natural reading speed helps to ensure that comprehension is maintained when reading. When you share a book with your child, they get to see good reading modelled for them. They establish a sense of the speed and prosody that is essential to fluent reading. This then aids in their comprehension of the story. To help your child hear themselves as a fluent reader, choose a favourite book, and take it in turns reading a sentence, such as in the style of echo reading, where you might read a sentence or a page first then your child repeats the same part. Hearing themselves as confident and fluent readers allows children to break out of the struggling reader mindset where every book is a challenge. Research shows that possessing a broad vocabulary is essential to making sure that children have access to a range of different words with different meanings. It makes sense that the more words that children know when reading independently, the more they’ll enjoy what they’re reading. While vocabulary lessons are taught in schools, parents can also assist in helping their children learn new words at home by reading favourite books aloud. Before reading a book for the first time, flick through the pages with your child. Look for any interesting words that your child might not have seen before. Talk about what these words mean and where they may have seen them before. Successful reading is all about making sense of what we’re reading. As adults, if we don’t quite understand something that we’ve just read, the first thing that we tend to do is to go back and reread. This is a vital skill that we need to encourage in our children to help them become self sufficient readers. Reading aloud provides the means by which to clearly take about what is happening in the book and to practice this rereading skill. The conversations about what the book is about can take place before reading with your child in order to predict what might happen. Discussions during and after reading are also usual in clarifying what your children have just read. Fathers and other significant males in a child’s life play a vital role in encouraging their children to be active readers at home. While mothers do tend to spend more time with their children and often take on reading as a part of this experience, research demonstrates clear benefits when dads, uncles, grandfathers and male friends read with children. 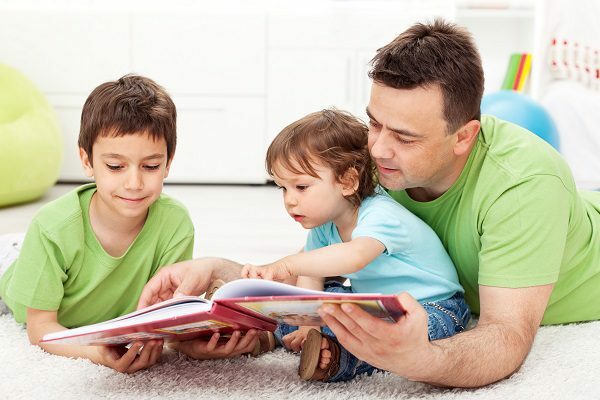 Dads are often seen as the untapped resource when it comes to reading with their children and they frequently provide a different range of experiences, especially when reading aloud. This might be through using different funny voices and even the content that is read together. As any avid reader knows there are few things better in life than curling up with a favourite book and not wanting to put it down. Sharing this experience with your child is a valuable way to get them on the path to loving books as well. Consider taking home a new book from the bookstore or library and selling this to your child. Try talking about the pictures, look at interesting words and predict what might happen before reading together. When you are reading the book aloud for the first time, use different voices for each character. If you’re looking for some inspiration on what to read to your child, then try the Children’s Book Council of Australia Awards shortlist, or the Dymock’s Top 51 Kids list which is voted for by kids for kids. This article was originally published on The Conversation and is re-printed here with permission. Read the original article.